Some of my best finds are the random ones, the ones I don’t even know I want until I see them. 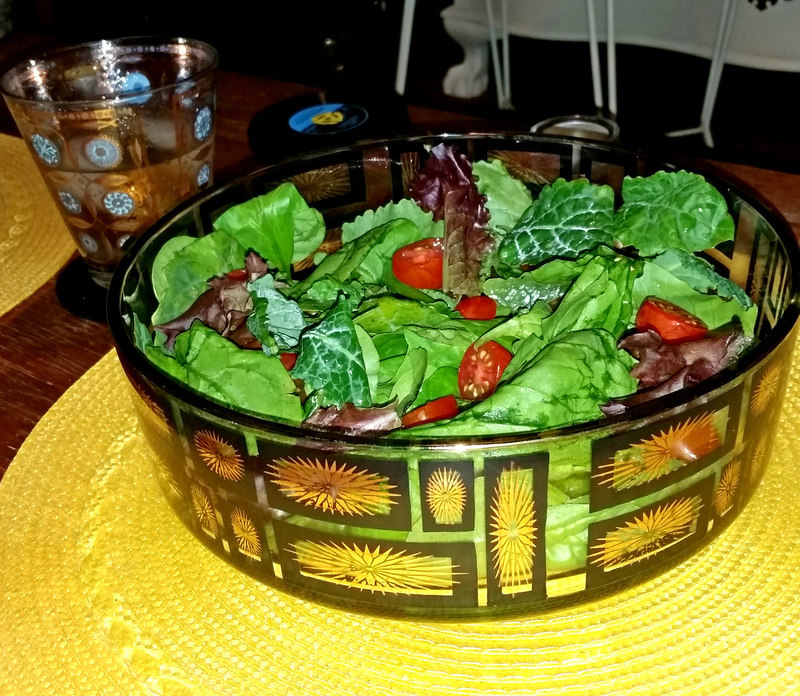 This beautiful salad bowl was like a bolt of lightning, jolting me with such awe when I saw it. The fun shape, striking design, and delightful black and gold rectangles and starbursts were of such a combination that I was helpless against its allure. Resistance was futile. It looks even better with a salad in it! Let me tell you, I love salads and they have become a great deal more enjoyable to make and eat with this beauty to put them in. I know, you’re sitting there rolling your eyes at me, thinking, “It’s just a bowl.” Yes, I know it’s just a bowl . . . just a fantastic bowl! I came upon one of the same shape but that had orange rectangles and sun faces on it. While I didn’t care for that particular surface design it did come with four small bowls that matched. When I stopped to consider that my bowl may have had small bowls that went with it at some point, I got a little weak in the knees. Oh, to possess them! 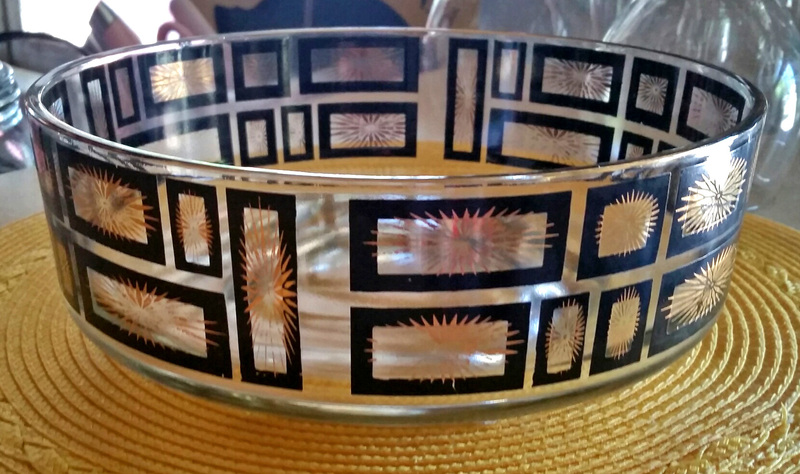 I have since found on eBay two bowls exactly the same except for the rectangles being red. One was a lone bowl, like mine, and the other had the small set of bowls with it. I was tempted to buy the full set, but the red didn’t speak to me as genuinely as the black. I may or may not find more bowls like it, to pair with this one, but I am certain my satisfaction with this one will not be fading. 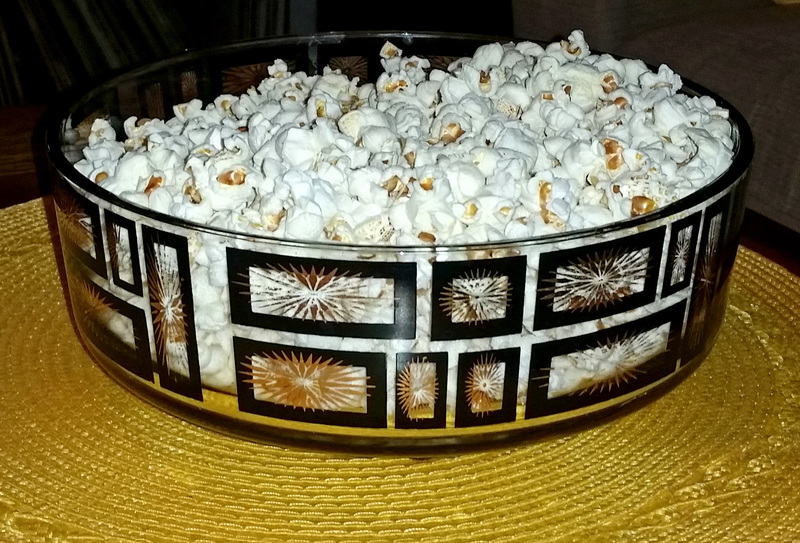 It’s just a bowl…but you can say that about a lot of functional items. I haven’t really seen this style before but they are very cool. If you eat first and foremost with your eyes than it must follow whatever you present the food in can help foster a welcoming, winning presentation. Loved the title!